A few years ago my family took a river cruise between Budapest, Hungary and Bucharest, Romania, and after we disembarked in Bucharest, we took a guided tour of Transylvania. One of the places we visited was Castle Bran, where Vlad the Impaler stayed. Vlad ruled this part of the world during the 1400s, and was particularly nasty. He tortured his victims, both enemies and countrymen. His methods included slowly boiling people in large pots and skewering others on large stakes in the courtyard for all to see. Since he would have them impaled through the skin on their back, they wouldn’t die fast. Instead, the victim suffered slowly over the course of a day or two. Quite the nice guy. Therefore, he became the inspiration for Bram Stoker’s Dracula. Our two tour guides told us that Romanians are really conflicted about the whole Dracula thing. They like that it generates revenue from tourists, but dislike how it puts the country in a negative light. One of the first stops on our tour was Castle Bran, where Vlad stayed on occasion. Outside of Romania, the castle is known as “Dracula’s Castle.” It’s a stunning castle that stands tall in the Carpathian mountains. We headed out early from Salamanca due west. Our goal was to be in Porto, Portugal by the end of the day. As we passed easily from Spain into Portugal, we noticed how nice the highways were. To be clear, Spain has great highways (better than most US interstates), but Portugal’s were even nicer. Smooth pavement, clearly marked signage, low traffic. We quickly found out why they were so nice and there were so few cars. Nearly every highway in Portugal is tolled! There were a few stretches for ~50 miles or so that weren’t tolled. But as you approached any major city the tollbooths came into view. We must have spent at least $200 or more on tolls in Portugal. As the morning wore on, we approached a city with a cool looking cathedral on a hill. We decided to pull over and go check it out. Guarda is a small city of 42,000 in a hilly region near the border with Spain. It was founded by King Sancho I in 1199. The main attraction is the cathedral. On this trip I used Google Maps heavily. I clicked on the cathedral and let Maps guide me, and it worked flawlessly. However, these old towns have tiny streets all throughout, many one-way and even across public squares. My rule was that if I saw other cars, I just kept going. Up and up we went, and soon we turned a corner, drove across the main square, and parked right in front of the church. Rock star parking! Thank god we had a small car. The cathedral construction began in 1199, and completed around 1550, and is a mix of Gothic and Manueline architectural styles. We entered the church, and to our delight, found we could climb a cylindrical staircase up to the the roof! That’s our second directive – climb everything we can. After taking several cool photos on the church rooftop, we stopped at a cafe on the square for a coffee. Then we were back in the car and off to Porto. The Ribbon has it all. Long slickrock with great views, ledges and edges (don’t cliff out! ), and a bonus cave at the end to walk through. 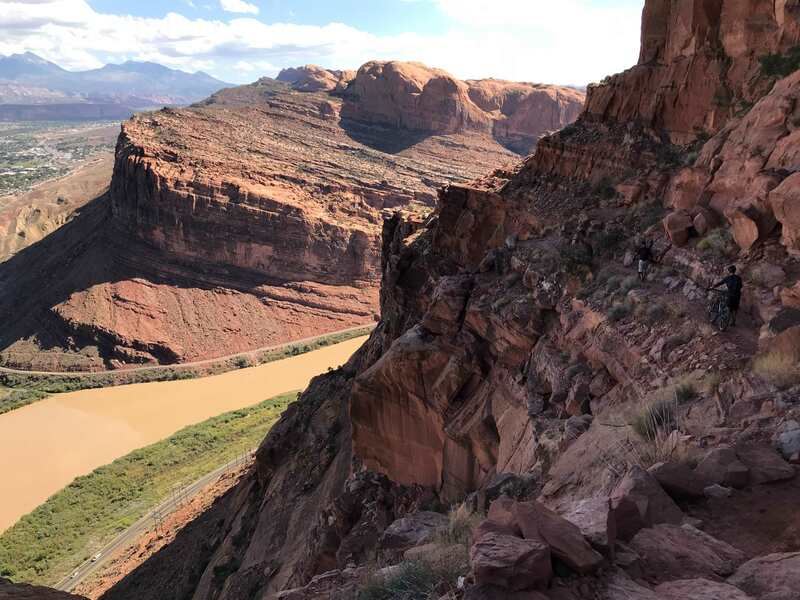 After living for two decades on the Colorado front range, I decided to not blow through Grand Junction for Fruita and Moab, and check out the Lunch Loops. I gotta say, this area is now high up on my favorites list. I started with The Ribbon, and was a bit nervous because my friend Jon warned me about this trail. It isn’t all that well marked, and takes some sharp turns to avoid 10-30 foot cliffs. Jon has a friend who cliffed out and had to be air-lifted to St Mary’s in Grand Junction (she healed up nicely). So I took my time. But wow, it’s such a cool trail. Shortly after leaving the top parking lot you pop out onto an enormous slab of slick rock. You ride fast for a long time, but you must pay attention as the rock narrows to just a few feet wide. Then you drop down into a tight set of turns through a feature. After the feature you again get atop a long slab of slickrock and fly down it to a stream bed. Near the end of the trail you pass the start of Andy’s Loop, and hike up out of the canyon. But as you ascend, you’ll find a bonus – a cave on the left. Stop to walk into and check it out. I had parked up on the road, and so I headed back to my car, but if you started below, Andy’s is a great ride. After stopping at Cáceres we headed onto and arrived late in the afternoon in Salamanca. Salamanca is the capital of the Salamanca province, part of the Castile and León region, and dates back to Celtic times. Thanks to Booking.com we found a nice hotel near another old Roman bridge, checked in, and headed into old town to the main square. As we passed the cathedral, we decided to do a quick tour before it closed. The cathedral was constructed between the 16th and 18th centuries and has a mix of late Gothic and Baroque styles. After the tour, we again headed toward the Plaza Major. We were all getting a little “hangry,” so we stopped at restaurant on the square and had a wonderful Spanish dinner. One thing I had learned by this point in the trip is when we are getting hangry, don’t try to find the best restaurant on Yelp. Just pick something close – it’s going to be excellent, and we won’t be chewing on one another! After dinner, we then headed back to the hotel, and caught some nice photos of the sunset and Roman bridge at night. The next day we would head due west into Portugal. Portal is the last segment of Mag 7, and epic. Epic in exposure (next to a 1300 foot cliff), epic in views of Moab and the valley below, and epic in technical descent down to the highway. The initial trail is easy and rideable. Then, the left side of the trail disappears, and the cliff is just a few inches off the trail. where’d the left side go? The trail is difficult enough, and then my friend Brian endoed. Bryan was fine – he got up and dusted himself off. At that point, we all got a little more conservative and off the bikes. There are two BLM signs on the trail that warn you to “Dismount now, bikers have died here” and we heeded the warnings. After the exposure, the drop down to the highway is hugely technical and lots of hike-a-bike unless you are a rock hopping expert. I was able to catch Bryan’s endo on the vid below. 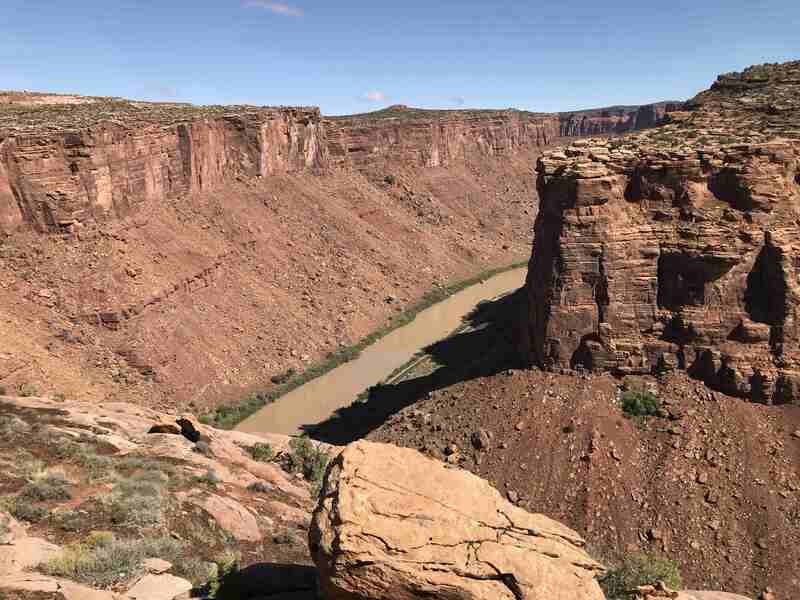 After Little Canyon you begin a climb up Gold Bar to Gold Bar Rim, and from there you can ride the rim of the canyon leading into Moab. After a long day of riding mostly downhill on Mag 7, the sudden hard climbing is a bit of a shock to the system, but stick with it – the rewards will be worth it. The views are spectacular all around. Panorama shots were made for this route! There’s LOTS of exposure, so you have to really watch where you ride. An older, more dangerous route right along the cliff edge is marked with blue dots, but the newer, less exposed route is marked with yellow dots. You get to choose your level the exposure amount for much of the ride. The route is full of technical ups and downs, but most of it is rideable for a skilled biker. You might want to check out the drops before dumping into them so that you can pick the best path. As you proceed along the rim, you’ll hit a fork and can go left up to the famous Portal trail, or right onto Poison Spider. After Bull Run, Great Escape continues the rolling through scrub and rocks. The La Sals become more pronounced in the distance as you approach Moab. You then ride a short section of Little Canyon before the climb up Gold Bar. 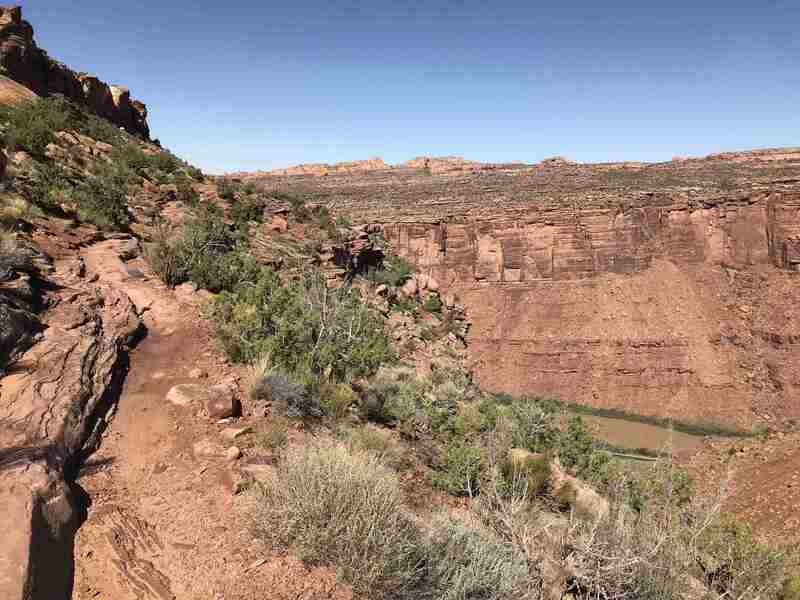 Bull Run is one of the first segments of the Mag 7 (Magnificent 7) ride in Moab. It’s full of rolling through the dirt and scrub brush as well as riding the ledges and edges of a canyon. On Bull Run I met up with two strong riders from Santa Cruz, Tom and Brian, and follow-cam’ed them for the rest of Mag 7. In the first part of the ride the canyon is on your left, then you transition to another where it’s on your right. The views toward Moab and the La Sals are spectacular. At the end of UPS and the LPS, the Whole Enchilada trail takes a gentle left turn away from cliff edge and becomes Porcupine Rim. If you don’t like rock gardens, you are really going to hate the top of Porcupine Rim. For miles you hop bowling ball sized rocks and 6 inch high ledges, and it can really give your upper body a shake. And it’s hard on bikes – I once taco’ed my big chain ring on a ledge and had to ride granny gear all the way back to Moab! But I love screaming down the trail dodging the rocks as the valley below opens up. As you descend you come to the edge of Jackass Canyon. From there you again ride cliffs down to the Colorado River. At the end of this ride you ride down to a tunnel under the highway. At this point I was relaxed, and of course, where the trail was smooth and easy I endo’ed for the first time in ten years. I learned how to roll through endos when I first started riding and was able to come out of it with just a minor flesh wound. Thank god for my helmet – it was seriously broken in several places. And I caught the whole thing in the video below. I was lucky to be able to get out to Moab early this week. It was a dicey drive in heavy fog and snow through an early season storm that hit both Utah and Colorado. When I got to Moab, I found out I had just missed by a day the ability to shuttle up to Burro Pass. The pass was closed because of snow and mud. However, the upside was that riding UPS / LPS was like riding on the clouds, and I got some really nice pictures. UPS / LPS is such a great ride. You move through the brush and then every so often pop out right on the cliff edge giving you a bit of a jolt. Then back into the brush, then back to the edge. It’s a huge rush.